This week our CEO and veteran road warrior, Mike Smith, hit the ground in Las Vegas and Reno for the Sierra Nevada Mountains— to help shed light on the conservation plight of desert bighorn sheep on behalf of the Wild Sheep Foundation. Armored with a Canon Powershot and the will to deliver, Mike with the GreenSmith PR team’s help secured two TV studio interviews, three newspaper office interviews, an NPR report and two field trips to witness the majesty of the iconic bighorn sheep. Despite the seemingly effortless execution of the GreenSmith PR team, a cross-country media tour in two different cities in 48 to 72 hours is no small feat. Bighorn sheep with bird on its back. Photo by Mike Smith. To kick-off the tour, Mike landed in Las Vegas and immediately hit the ground running. First stop: KLAS-TV and CBS studio interview with Chairman of the Wild Sheep Foundation Brett Jefferson on the Nevada Test and Training Range (NTTR) expansion. 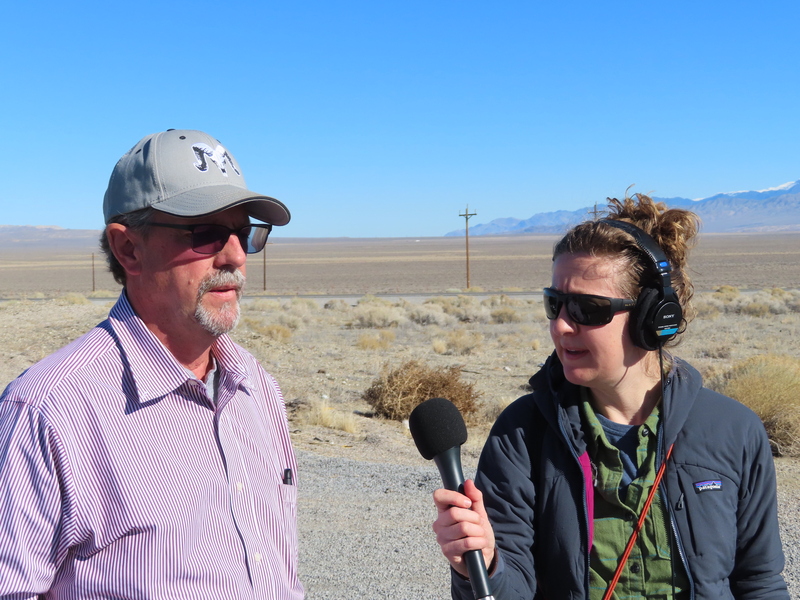 The interview focus was on a Proposal by the U.S. Air Force to take over another 300,000 acres of the National Desert Wildlife Refuge, just north of Las Vegas, prime sheep territory. Having military strafing targets along the mountain ranges may create issues for some major bighorn herds. 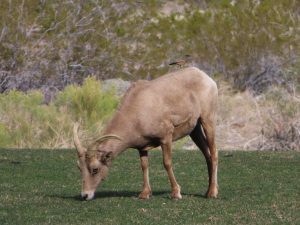 Nevada has 12,000 bighorn sheep (more than any other state with the exception of Alaska) and we want to protect them, as well as the 67 other species that call the mountain range home. Not to mention the Refuge was originally created to be a safe space for these incredible creatures. There are currently water sources managed by Wild Sheep Foundation and the Fraternity of Desert Bighorn folks that will not be properly maintained during droughts if Nellis Air Force base expands in this direction. And being in the desert where natural water sources are not always available, this is huge. We went on to talk with the Las Vegas Sun editor and the Las Vegas Review Journal environmental reporter about the balance of DoD requirements and species preservation. But the Air Force is not the only institution looking to upgrade its base operations. The Fallon Naval Air Station wants an additional 600,000 acres. After his brief day in Vegas, Mike made his way to Reno, NV. He met with Dr. Peri Wolff, Wildlife Veterinarian with the Nevada Department of Wildlife and bighorn expert, to talk about how the proposed land acquisition by the Navy to the north of the state could impact populations in Nevada. In Reno the second TV interview took place at the KRNV-TV NBC studio with Nevada Department of Wildlife Game Division Administrator, Brian Wakeling, who continued the conversation on the base expansion into land currently occupied by scattered populations of bighorn sheep. Ultimately this conversation is one that should include the Department of Defense, according to Wakeling. Is there a way to meet DoD needs while still maintain conservation efforts? Closing the tour in Fallon, Nevada, Mike was accompanied by Wild Sheep Foundation and Fallon Bighorn representative Carl Erquiaga (pictured above). Carl showed the Reno Gazette and KUNR (NPR) media where the proposed Naval Air Station expansion would take place. He also gave a holistic perspective on how this expansion might impact resident bighorn sheep. And all these visits came within just 48 to 72 hours! It makes us all want to “count sheep” and go right to sleep.